Black holes are so strange, so counterintuitive, it's hard to believe they actually exist. Yet scientists say the evidence that black holes are real is almost rock-solid. Among the pioneering physicists who've shed light on these dark objects is Kip Thorne, an emeritus professor at Caltech and architect of some of the leading cosmological theories of how black holes warp space and time. Thorne describes some of the latest thinking on black holes in a paper published in the Aug. 3 issue of the journal Science. We caught up with Thorne about warped space, the nature of singularities inside black holes, and the search for a grand unified theory of physics. 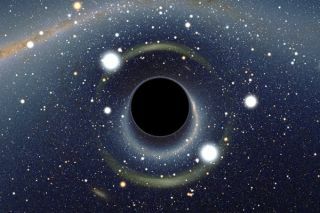 SPACE.com: In your paper, you say black holes are objects made wholly and solely of space-time. How can that be? Aren't they also made of mass? SPACE.com: When an object like a star becomes a black hole, what happens to its mass? Thorne: The matter of which a star is made, the atoms of which a star is made, are destroyed at the center of a black hole, when the black hole is created. The matter is gone, but the mass, in the sense of mass and energy being equivalent, has gone into the warped space-time of the black hole. SPACE.com: You also talk about collisions between two black holes. Is this something that we think happens often? Thorne: It happens, we think, in our own galaxy about once every 100,000 years. We're not sure of that number — it could be every 10,000 years or once every 10 million years. Looking out through the entire observable universe, it's going to happen more like once a minute or once a second. SPACE.com: What happens to space-time when two black holes collide? Thorne: Each black hole spins on its axis like the Earth spins. That spin creates two vortexes of twisting space, somewhat like vortexes in a bathtub or a whirlpool. There's one vortex of twisting space that sticks out of the north pole of the black hole, and one vortex that sticks out of the south pole. That's one aspect of a black hole's warped space-time. There are others, but let's just talk about that one. When two black holes orbit around each other and collide and merge, those vortexes then start sweeping around and around the merged black holes. They get deposited onto the surface, what we call the horizon, of the merged black holes, so you now have four of these vortexes on the horizon. And as the black hole turns, these vortexes sweep back like the spiral arms of a galaxy, or like water from a whirling sprinkler; they reach outward and backwards and they become these gravitational waves. SPACE.com: Is there any chance that black holes don't exist? Thorne: We have very extensive observational evidence by now of black holes. The central dark object at the middle of our galaxy has been studied in beautiful observations [showing] bright stars that travel around the central object in orbits rather like the orbit of a comet. They swing in close to the object and then are thrown back out. The object can be weighed and it seems to weigh between 3 and 4 million times what the sun weighs. It's not producing any light, but it does produce, in erratic ways over time, bursts of radio waves. This object is just like what we think a black hole should be. This still from a computer animation shows a simulation of a giant space cloud falling into Sagittarius A*, the supermassive black hole at the center of our own Milky Way galaxy, in mid-2013. Image added on July 2, 2012. So I think in the minds of astronomers now, there's no doubt. There certainly was doubt 10, 20, 30 years ago. But the observational data from electromagnetic observations have become so good, so impressive, that I don't think there's any doubt anymore. SPACE.com: When people talk about black holes, they talk about singularities at their centers. Is a singularity really a spot of infinite density and zero volume? As you near the singularity, we expect that it stretches and squeezes you in a chaotic way that ultimately kills you and destroys the matter of which you're made. And when you get right to the singularity itself, the laws of physics as we know them break down and the laws of quantum gravity take hold. Since we don't understand those laws very well yet, we can't say what the nature of the very core of the singularity is. SPACE.com: To truly understand what's going on inside black holes, are we going to need a grand unified theory? Thorne: We're going to need a definitive quantum theory of gravity, which is part of a grand unified theory — it's the main missing piece. We have to have a combination of general relativity that describes the warping of space and time, and quantum physics, which describes the uncertainties in that warping and how they change.